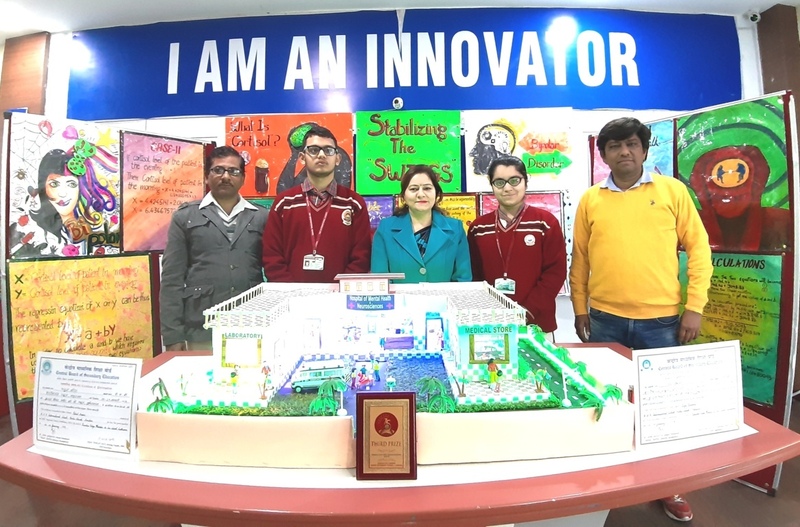 DAV International School, Amritsar added another feather to its cap by bagging the third position in CBSE Regional level Science Exhibition held at Kundan Vidya Mandir, Ludhiana on 28th & 29th January,2019.The Model ‘Stabilizing the Swings’ presented by Diya Khanna (X1) and Pahul Arora (X) got selected in the Meritorious list & will now represent the school in the CBSE National level Science Exhibition to be held at Mayur School, Noida on 8th & 9th February,2019.Students of 130 CBSE Schools of Panchkula Zone presented multifarious Models on different fields of Maths & Science out of which only 24 Models got selected for the National level competition. Such Competitions can prove to be strongly instrumental in solving complex problems of mental tension & anxiety. The School has a history of successful selections in the competitions of Maths & Science & got a rare honour of making a hat trick in Mathematics this time by getting position for the third time in a row. Principal Dr. Anjana Gupta felicitated the participants for the great achievement & wished them luck for the National level Competition. She owed this success to hard work & determination of the students & to right guidance of the teachers.